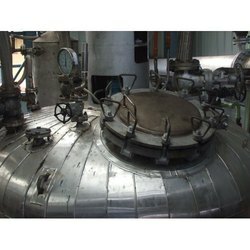 Jaya Industries basically an AS-ME Coded equipments manufacturing house with a utility machine shop facilities with proven expertise in designing and execution of chemical plants and equipments. Also manufacture welded steel tanks as per API code. Jaya Industries has extensive in-house facilities of finite element analysis (stress analysis) using software packages. It also having extensive experience in different types of product testing including NDT, Hydro & Pneumatic Test of equipments. It maintains in-house Quality Control Checks and Excellent Documentation. Jaya Industries manufacture-red numbers of Stainless Steel and Carbon Steel Pressure vessels, which has been hydraulically tested in the range of 3-47 kg/cm2g. These vessels were designed and manufacturered for our reputed customers like Indian Oil Corporation Ltd., MCC PTA Indian Corp. Pvt Ltd., Himadri Chemical Corporation Pvt Ltd., Balmer Lawrie & co. Ltd.,O.N.G.C Ltd, United Engineering (E) Corporation, L&T Ltd. etc. Vessels being operated under vaccum are also in our list of manufacture. Jaya Industries poses Experienced Construction Engineers and Fabrication Team to carry on site fabrication including testing and commissioning of plants and equipments. Jaya Industries has manufacture-red considerable quantities of storage tank/ vessel at project site. Other than vessel and tank ages, JI extended its services of manufacturing in the field of Paper Plant, Steel Plant etc. These type of manufacturing not only includes decent fabrication with extensive and high accuracy machine but a close tolerances also has to be maintained within critical assemblies.